Yesterday at 4:30 PM, my mother picked me up from a friend’s house two miles away. Upon entering the street we live on, I see the brightest thing I ever have: a generator exploding. And that’s when we realized that we, and about 20 other houses have no power. Basically, we haven’t had any power since 4:30 PM last night. It was a very cold sleep, and colder this morning. Because of that, we broke out our ten year old Honda generator (VTEC bro), and set up the most ridiculous extension cord set up this side of a North Korean construction site. We’ve got the important things set up, such as the refrigerator, TV and Internet, as it is too small to handle the heater and stove. 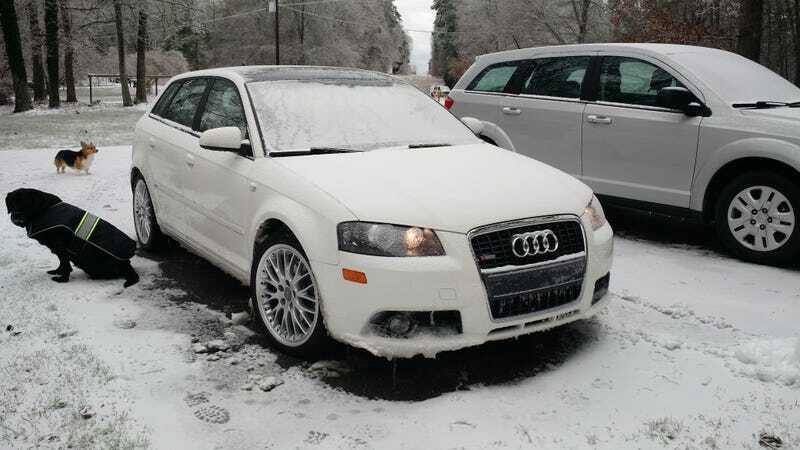 Since we were quite bored, Robbie (live-in family friend) and I did a bit of late night hooning in our 2006 Audi A3 3.2 Quattro, a vehicle we have nicknamed The Ice Champion, around mall parking lots. We also checked out the local Mazda/Lincoln dealer, which was the first time I got close to the new Miata. I really like it. Overall, things are getting better and better. I talked to the Duke Energy guy fixing the transformer this morning, and he said that everything should be fixed in, “just a few hours.” We have since learned that we’ll probably be out until Monday.